To me, a good brunch begins and ends with Eggs Benedict. I was first treated to the delightful dish at the Hyatt in Melbourne in the 80’s. I can still remember the mixture of flavours and textures; the soft poached eggs, the crisp muffin and the sharp and creamy hollandaise sauce. It is thought that Eggs Benedict was dreamed up by a chap called Lemuel Benedict. Lemuel was staying at the Waldorf Hotel looking for a hangover cure one morning, when he asked for buttered toast, poached eggs and crisp bacon with hollandaise sauce. The maître d’hôtel was so impressed by the dish that he put it on the menu but used toasted English muffins instead of toast calling it Eggs Benedict. There are lots of variations to the dish, with some people using ham instead of bacon, adding a slice of tomato or avocado and substituting smoked salmon for the bacon. Today I was at the Stowaway Café in Bayview. The Stowaway is on Pittwater, just along from the “doggy beach”. The set-up is dog-friendly with water bowls and plenty of places for people to sit with their pooches before or after a run on the beach. I have been to the Stowaway Café many times before, but have not visited recently. It seems to be the same owners Chris and Tiara and the same fantastic location right on the water at the bottom of Pittwater. On a sunny day, this is the perfect place for a weekend brunch but they have a large and loyal following, so it can get very busy. The coffee is good and comes out quickly, but I have to say I was a little disappointed in the “Boaties Benedict” which is their interpretation of Eggs Benedict. 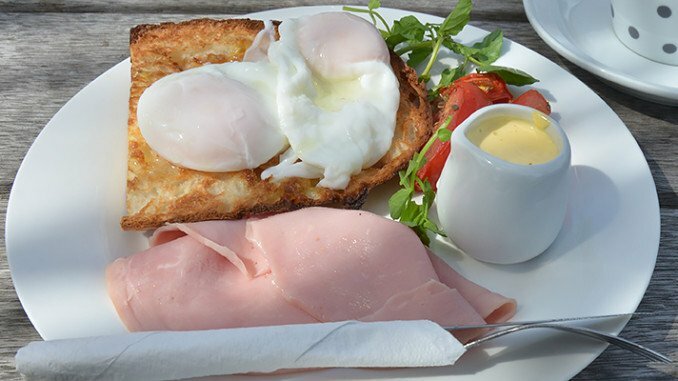 Served on toasted Turkish bread were two poached eggs but the sauce didn’t have the tangy zing I was looking for, the ham was ordinary and the eggs could have done with another minute or two in the water. Don’t get me wrong, it wasn’t a bad meal, the sun was shining, the coffee was lovely but the eggs were a letdown because I have been there many times before and have previously had a really good smoked salmon Eggs Benedict; piled on to two beautifully cooked English muffins, a tangy hollandaise sauce and a little drizzle of Salmon Roe with Rocket. Details. Details turn a dish from ho-hum in to something spectacular. And today’s version was lacking detail. Would I go back? Of course I would. It’s a great spot. Super-friendly staff. Good coffee. But I would want them to pick-up their game, just a little.